This unique and patented system allows the water to flow through hundreds of razor sharp triangular blades which are mounted (depending on the model) with gaps of 50, 100, 150 and 200 micron (1 micron=0.001mm). The water runs against the sharp side of the blade where the surface tension of the water is broken. The dirt particle, whether sinking or floating is pushed away from the sieve due to the Hydrostatic load created, this causes the solids to be lifted out of the water. The dirt from the water is then moved to the base of the sieve where there is no water running and can be removed easily. This dirt can not pollute the water anymore by dissolving. This system will work superbly in the place of vortexes and especially brush chambers. Both of the filters mentioned are absolutely not necessary anymore, and it is even better to remove them completely. Under the sieve the clean water is pumped away with a maximum rate of 3300 gallons per hour. Also available is a stainless steel pump with ceramic bearings, which can be integrated with the total system. In this way it is possible to run your complete pond system with only one pump. This pump can for example run the EstroSieve, Ozone reactor and biological filter together. This unique system, unlike any other, is completely independent of the water flow. The EstroSieve can be used as a gravity fed system with a 110mm inlet and outlet and is very easy to install on new or existing systems. This unit combined with for example a Bubble Bead and Ozone generator, provides the complete solution to your pond. A complete 13000 gallon pond system that fits into the back of your car. All solids, parasites etc. are lifted out of the water meaning much less ammonia. less nitrite and less nitrate which will also mean much less algae. The EstroSieve makes further aeration totally unnecessary. At the point where the water is going through the sieve forms an under pressure and the oxygen is sucked into the water. The oxygen enriched water is very useful to connect directly onto your biological filter. No dirt anymore and lots of oxygen. Different kinds of wedge wire sieve units are available allowing the solids from 30 microns upwards to be stripped from the water. Floating algae, parasites, parasite eggs and fish waste are just a few things that this unit will lift out of the water. The result is even better than a very costly sand filter with a fraction of the running cost. The EstroSieve is the only filter which is capable of taking floating algae out of the water during a period of time. It becomes a great advantage to take the floating algae out of the water rather than to kill it with U.V. or ozone. By lifting the algae from the water you also take out the nitrate-element. This will stop the circle of death algae - ammonia - nitrite - nitrate - algae. EstroSieve is breaking this visual circle. EstroSieve is combining vortex, brushes and sand filter. 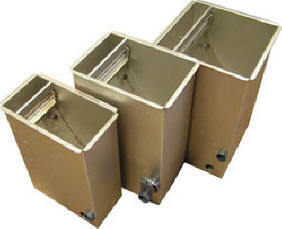 Sieve elements are interchangeable and can be supplied separately. All sieve elements are made with high precision laser technology for a superior quality. The base of the sieve is made from a seawater resistant stainless steel 316L for guaranteed quality.